I would like to start by thanking everyone for their support towards my first major solo exhibition Chroma, which took place at BLANKSPACE in Manchester over the month of July. An overwhelming number of people attended the exhibition and related events including the preview and artist talk. If you missed it, images of the work can be seen on my website over the next few weeks. Alternatively you can take a look on my Flickr page. I was so glad to be given the opportunity to make three new ambitious site-specific works within the gallery. Thanks to Mark Devereux for curating the exhibition, Arts Council England and all those that supported my crowd funding project. There are only a few limited edition Chroma exhibition catalogues left which can be purchased for £10 through my website or by clicking HERE. Below is a quick update of various exhibitions and events that I am involved with in next few months. Exciting times ahead! 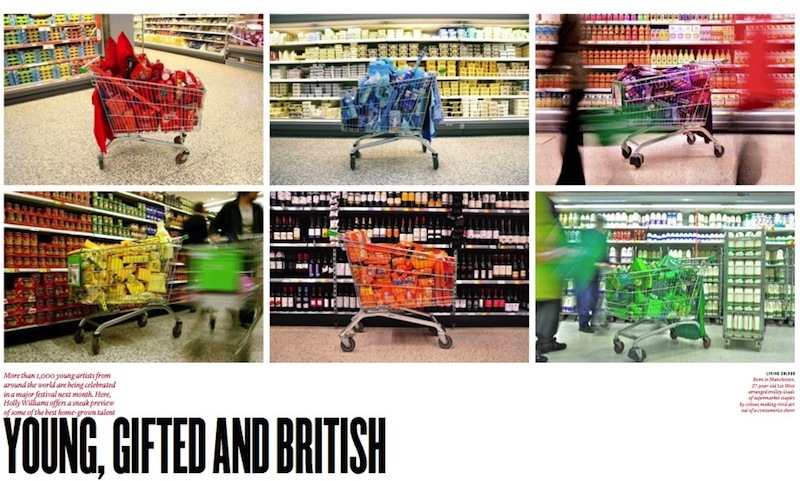 I am very excited to tell you that my entire series of six Trolley photographs will feature in The Independent on Sunday Magazine this week (26 August). Holly Williams’ article Young, Gifted and British offers a sneak preview of some of the best home-grown talent taking part in World Event Young Artists next month in Nottingham. I shall be participating in World Event Young Artists 2012 taking place across venues in Nottingham. My work will be exhibited in Nottingham Trent University’s Bonington Gallery. World Event Young Artists is the very first event of its kind to take place. It is an exciting occasion bringing together and celebrating the talent and artistic excellence of young people from across the globe. In September 2012 World Event for Young Artists will bring a staggering 1,000 young artists (18 – 30 years) from 120 nations to Nottingham. Over a period of 10 days, artists will bring the city to life with creative activity across all art forms including visual arts, music and gastronomy. These artists will have the chance to showcase their practice, exchange ideas and build future collaborations. The IAQA is a contemporary art collective exploring the idea of artistic visions which intuitively reach beyond this three-dimensional, material world to explore alternative possible realities through taking a positive approach. This collective are pleased to announce their first exhibition at Bar Lane Gallery in York. The show will explore the statement Beyond the Material World and aims to be inspirational and encouraging others to reach out towards a more positive and sustainable future. Works featured will move away from dominating fixed theories and measures of conventional science. We are taking the view that art can be viewed as a platform for multiple expressions of social ideals; where art and science co-exist harmoniously. The exhibition strives to have a holistic and egalitarian approach which asks all who participate how we can construct a new outcome or world view together. The works considered provide positive, awe inspiring futures rather than promoting any apocalyptical visions. Launch 28th September. Continues 29th – 30th September. It is my pleasure to invite you to this year’s Open Studios at Rogue Artists Studios in Manchester. Join me for the opening night and continuing over the whole weekend. Open Studios allows you a peek behind the doors (or curtains) of artists at work. Once a year Rogue opens it’s doors to the public in it’s Open Studios event inviting fellow artists, curators and the general public to access all areas of the studios while affording members an opportunity to exhibit and offer work for sale. This year's Rogue Open Studios is over the weekend of September 29th/30th with the opening party on Friday September 28th from 6-9pm. Opening hours over the weekend are 12pm-5pm Saturday and 12pm-4pm Sunday. Looking forward to seeing you then.